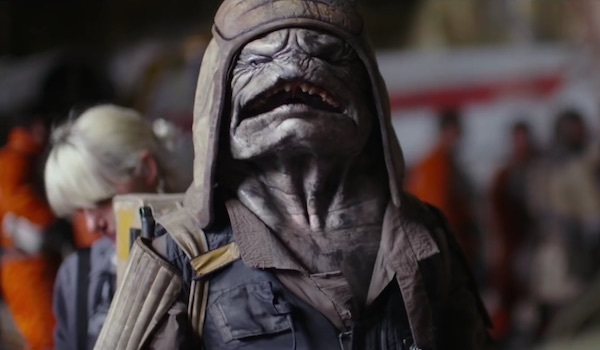 Rogue One: A Star Wars Story introduced fans to several new alien species. While many of the species aren't named on screen, the Lucasfilm Story Group's Pablo Hidalgo revealed many details about the book Star Wars: Rogue One: The Ultimate Visual Guide. Hidalgo spoke with StarWars.com recently about some of the new aliens in the and how he came up with their backstories. "Wherever possible, I try to talk to the Neal Scanlan in the creature shop to ask about what were their inspirations in creating a character. When I visited the Rogue One set, I had a crash-course in the aliens. In the case of Pao, the idea that he had these amphibian roots was too good to resist. And I thought it would make a fun contrast to the giant shouting mouth to show the softer side of Pao." "The color design came from production; I rationalized it by making it specific to an environment. But I love the idea of diversity within an alien species. We’ve seen a wider variety of Mon Cal colors in The Clone Wars than just the red ones. I think having the colorful ones be from tropical environs and the black-and-white ones be from colder extremes work with Raddus’ no-nonsense personality. It also allows for someone to make “cold fish” jokes."